The warning hits one of Ecuador’s most promising new areas for tourist growth and highlights the ongoing border issues between it and neighbor Colombia. British tourists in Ecuador have been warned about the dangers involved with travelling near the border with Colombia, following the recent kidnapping of 29-year-old Kathryn Cox from a remote nature reserve. 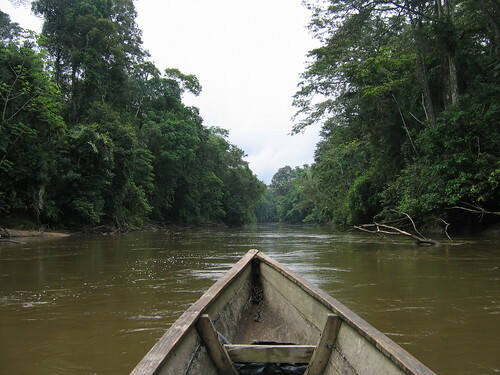 A boat along the Cuyabeno River in Ecuador. Photo by Rinaldo Wurglitsch. Ms Cox and a 32-year-old Australian woman were kidnapped on Friday during an organised canoe trip in the Cuyabeno Wildlife Reserve, in the north east of the country. The pair were rescued by security forces around 24 hours later. The Foreign Office has now updated its advice for Britons visiting Ecuador, urging travellers to take particular care in areas which border Colombia. It also warns that a 20km (12.5-mile) exclusion zone exists along the border with Colombia, and advises against all travel to border areas in the Carchi province. The Cuyabeno reserve, in the Sucumbios province, is an area of great biodiversity, containing 12,000 different plant species, including 60 types of orchid. It is also home to around 550 bird species, 350 types of fish, anacondas, alligators, river turtles, and armadillos. Ecotourism in the region began in the 1990s – a number of lodges can now be found within the reserve. Around 24,300 Britons visited Ecuador last year. The Foreign Office also advises those who visit the country to avoid all travel to San Lorenzo, in the Province of Esmeraldas, due to criminal activity.